5 Reasons to Read “A Fool and His Monet”! “A Fool and His Monet” is a DELIGHTFUL new book written by Sandra Orchard, and published by Revell in the spring of 2016. But don’t just take my word for it, keep reading for 5 reasons why you can’t miss this new release! 1. The storyline is unique. After all, it’s not every day that a new FBI agent must solve a dead-end case with the advice of her special-agent-wannabe Aunt Martha, a protective coworker, a mysterious yet helpful apartment superintendent, and a mother who wishes she would leave her dangerous job and work at a TUMS factory. Charming, Eccentric, and Hopefully the First of a Long Series! 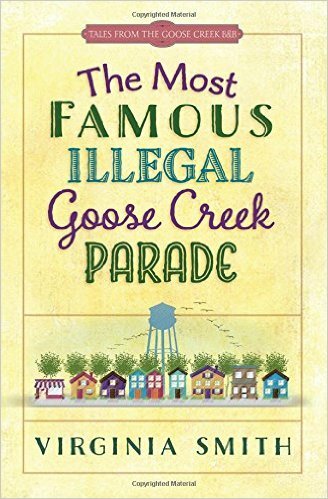 I have two words to describe Virginia Smith’s The Most Famous Illegal Goose Creek Parade… Utterly charming! It is truly the type of book that creates a strong desire in readers to crawl inside the pages and live there. Permanently. At least that’s how I felt, especially after my feelings of devastation at reaching the final page. With its blend of comedy and quirkiness, wisdom and whimsy, the town of Goose Creek is sure to win your heart, too. Special announcement: Tim Hawkins has written his first, book entitled “Diary of a Jackwagon”!